Tom Cruise as Ethan Hunt in Mission Impossible — Fallout. In this scene, he has just flown a helicopter from a medical camp in Kashmir. 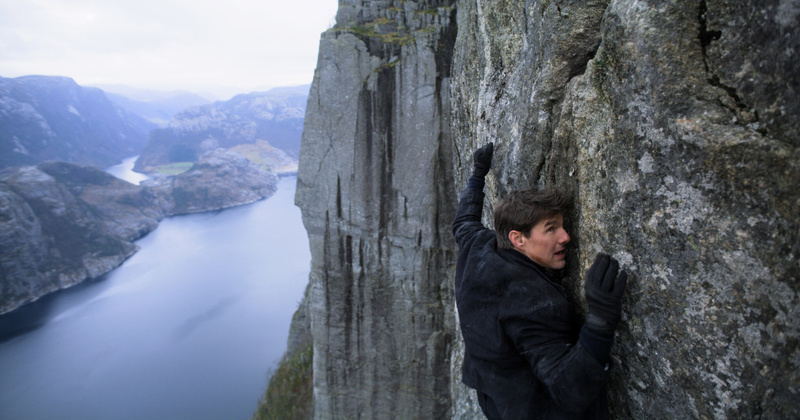 We asked Aleena Khan, 28, to share her thoughts on Mission Impossible — Fallout, which was released in theaters on July 27. She watched the film in London a few weeks ago. "I love Tom Cruise — I quite like his smile, really — and thought it was a typical Mission Impossible film." But, she says, "the global health elements were crazy!" From 2012 to 2015, Khan worked as a project coordinator with a group in her native Pakistan called CHIP on a project funded by UNICEF, the U.N.'s children's agency, and Gavi, a global vaccine alliance, to raise awareness for immunization and safe births. One of the places where she worked was a city called Skardu in Gilgit-Baltistan, a mountainous territory on the border of Kashmir. "The health concerns there are quite similar to Kashmir," she says. "There's lots of snow, roads are nonexistent or really narrow and that makes it hard for people to access health care." We asked Khan, who currently manages grants for health care projects for girls and women for Amref Health Africa UK, to truth-squad some of the health-themed scenes in the film and to share a bit about what health care is like in the region. This interview has been edited for length and clarity. To viewers who haven't watched the film yet — there are some spoilers ahead! There's a scene in the film where Ethan Hunt, played by Tom Cruise, is in a medical camp in Kashmir, a territory that borders China, India and Pakistan. Health workers there have just finished an immunization campaign. Is that a normal activity in this part of the world? Yes. When I was in Skardu, we worked with local health workers to raise awareness for the importance of vaccines and all the diseases [they] can protect you against: diphtheria, polio, whooping cough, TB, tetanus. We set up vaccination camps in hard-to-reach areas to help people access the vaccines. What are some of the challenges of reaching out to people in this region? There are a lot of myths associated with illness; for example, the concept of the evil eye — which is why a person might get sick or lose her baby. When I tried to explain tetanus shots and how it [protects] the body from disease, one mother said she believes that diseases are "because of the jinn" — evil spirits. So I asked her: What's the solution to protecting herself against disease? She said to pray to God. We spent a lot of time working with the communities to help them realize that prayer has its place — but there are vaccines to make sure the mother and baby are safe, too. The medical camp in the film — run by a fictional aid group called HAO, the Humanitarian Aid Organization — is set up to do immunizations. It looks remarkably high-tech. There are even X-ray machines. Is it a realistic depiction? It didn't look like a medical camp to me! So what does a real immunization effort look like in the field? We would have a really small tent, some benches and chairs for seating, and women coming in with their children. There would be a little table where vaccinators had their vaccination cards and sheets. The vaccinator would sit with his cold box of vaccines right next to him on another chair, and inoculations would happen right in the tent. The camp in the film is also pretty sprawling, with dozens of white tents, a helicopter pad and radio towers. When would such a big camp be set up? When you have something like a major earthquake, where there are a lot of displaced people, big medical needs, big foreign investment and foreign countries coming in and out. In the film, the bad guy created a smallpox outbreak in the area to set up the infrastructure — the medical camp — to "fix" it. But actually the camp is a disguise for more nefarious activities. What's your reaction to that plot point? It kind of reinforces the mistrust that a lot of developing countries have for big, international aid organizations. Someone cynical about the aid industry could argue that donors in the developed world create problems in poor countries, just so we could then go and fix them. When I was working in Pakistan, a lot of people were very suspicious of the government's vaccination efforts, which has resulted in attacks on health workers in the country. They say: Why is the government so keen on vaccinations — paid for by foreign agencies — but not able to provide basic things? [To win people's trust], we deployed ordinary villagers to go door to door to sign people up for vaccination efforts in far-flung areas of Pakistan. Aside from your concerns about the global health angles, did you enjoy the film? I did sleep through some of the film the first time around — but that's because it was a Friday and I had just come from work.